Forza Horizon 2 was one of my favorite games of 2014. There was so much to do and I still haven’t finished everything. The plethora of content didn’t stop Turn 10 from dropping some fresh DLC on top of all the content in the original content. 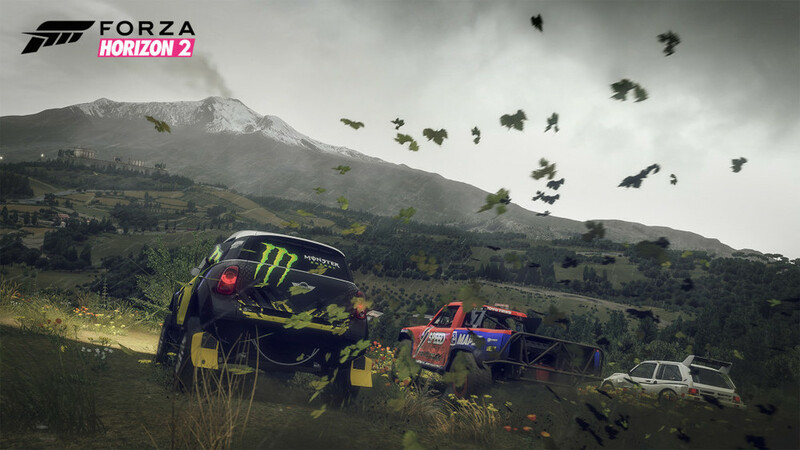 Storm Island is similar to the DLC from the first Forza Horizon because it adds rally racing. This time, however, they’ve thrown in inclement weather and it is a crazy amount of fun. Racing through torrential downpours or thick fog are a lot more fun when it isn’t real life. Although the size of the map is significantly smaller, there is still plenty to do. There are roughly 90 new events for you to take on. The new events include rampage, brawl, extreme cross-country, and gauntlets. Rampage events are off-road sprints, a brawl is an off-road circuit race, and extreme cross-country events cover various terrains with extreme weather. The primary focus is put on the new championship series. Combined with those new events are additional bucketlist challenges. I found these bucketlist events to be much more difficult than in the former ones. There are also discount boards to try to find. The weather can be very fun to drive in but it isn’t constant. Some races are locked into being under effect of intense storms. These are the previously mentioned Gauntlets and to pass them you must come in first place to unlock the next tier of championship series to race in. Although these races are more difficult than the standard ones they are still beatable given enough effort. Driving is noticeably harder in the intense storms; which is as it should be. The increase in difficulty is a nice change of pace. Driving around the slick and slippery turns force you to focus more than usual. It hovers over the line of becoming frustrating rather than challenging. Due to the game's extremely customizable difficulty settings, a few tweaks should let you adapt to the adverse weather. Within no time you should find yourself wiping around corners with ease. Overall, Storm Island is a ton of fun. The off-road free roam and races are a refreshing change of pace from the regular Horizon landscape that we grew accustomed to. There is also plenty of content to keep you busy. The weather effects also provide the right amount of frustration, as winding through a forest during a heavy rainstorms and taking insane jumps offers an endless supply of fun. Playground Games continues to set the standard in the genre and Forza Horizon 4 is no different. This is open world driving at its absolute finest. The spectacular visuals and stellar roster of cars are great, but the shared world and new weather system is really what makes this one of the best open world racing games this decade. Forza Horizon 3 is an absolute masterpiece. You’ll be hard pressed to find an open-world racing game that is this visually stunning, sounds this phenomenal, has this much content, and most importantly; this fun to play.